I tend to be drawn to anything having to do with leaves or trees in jewelry and jewelry making supplies. I also always enjoy working with glass components. So naturally, the glass leaf drops have quickly become a favorite of mine. I absolutely love that the brass loop at the top is built in, it makes designing with them a snap! I tend to make a lot of asymmetrical designs. I like that it makes the piece just a little more visually intriguing, and adds a level of uniqueness to it. 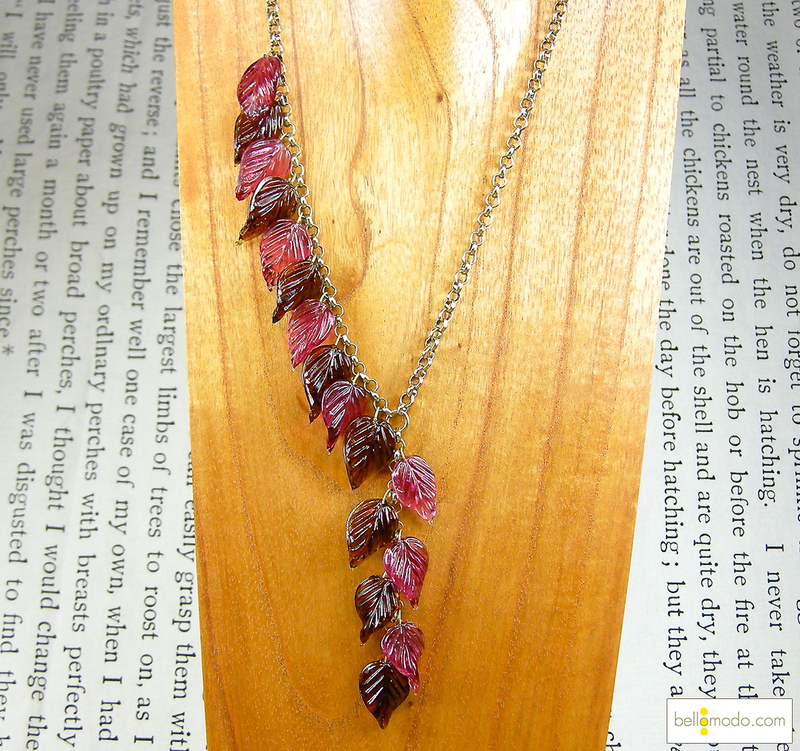 I literally saw this necklace in my mind’s eye the moment I picked up these pretty glass leaves. I’m quite happy with how it turned out… especially the asymmetry of it, as the leaves hang really nicely. Mixing brown with pink has always been a favorite of mine and since Marsala is the color of the year this necklace feels especially fitting (if you could combine these two colors, it would make Marsala!). Do you ever pick up components, and instantly see the finished design in your mind’s eye? What has inspired you in this way recently? Leave a comment and let us know! Cut three lengths of chain. Two lengths at 10&½” and one length at 2&¾”. Open your large, 8mm round jump-ring and slide the end of each of your three chains onto the jump-ring and close it. The shortest length will drop down in the front of the necklace. Use your two small jump-rings to attach both parts of the clasp to both ends of the long lengths of chain. Open the loop at the top of a Smoked Topaz leaf just as you would a jumpring or simple loop and attach it to the very last link of your short length of chain in the front of the necklace. Above that link of chain, leave three links open, and on the fourth one, attach a rose leaf. Again leaving three links open, on the fourth add another smoked topaz leaf. Repeat this pattern until you have added three leaves of each color and you are to the top of the short length of chain and center of the necklace. 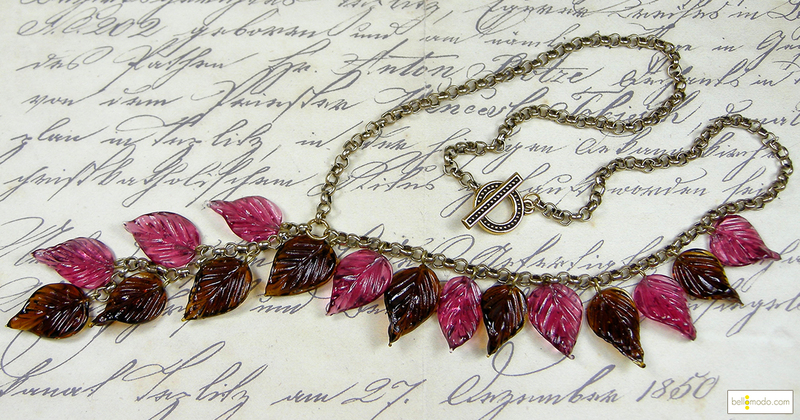 Choose a side of the necklace to attach the rest of your leaves to. Attach a brown leaf to the next link of chain, after the one that is attached to the large center jump-ring. Continue with the same previous pattern of skipping three chain links, and attaching a leaf to the forth one, rotating colors until you’ve used all your leaves. And you are done! The glass leaves come in a few shapes and multiple colors, you could mix and match as many as you would like! Not a fan of the asymmetrical look? run leaves up both sides of the necklace! Maybe mixing in some metal leaf charms would look nice? How about mixing in some lucite leaves? I love leaves as well. I use them in all my media including bleaching fabric, printing fabric and jewelry. Never ending uses! This is a lovely piece.